Why Disinfect at Water Well? Harmful bacteria and viruses can become present in untreated water well systems. Even pollution run off from pesticides, fuels, fertilizers and other substances can impact the health of a water well. Proper treatment is the only way to ensure a healthy water well system. When Should a Raleigh Water Well be Treated? Sanitizing a water well isn’t exactly a simple process. Just like with any construction project, certain dangers are inherently present when digging or repairing a water well. However, most people don’t realize that cleaning a contaminated well can be hazardous as well. Electrical Shock – wet connections or frayed wiring can cause shock if the electrical system isn’t turned off. A Raleigh well repair technician can properly diagnose and repair faulty wiring. Sharp/jagged debris – if a well has been contaminated by flooding or disasters, glass, wood and metal could be present. Debris should be removed without physically entering the well. Dangerous Vapors and Gases – Certain gases can accumulate in closed water wells and chlorine solutions used to treat contaminated water wells can cause skin and eye irritation and emit harmful vapors. Working in open air areas is ideal to avoid vapor inhalation. Improper Dosage – Cleansing the well requires precise measurement of the solution to adequately decontaminate the well. Too little solution and the bacteria and other contaminants can survive. 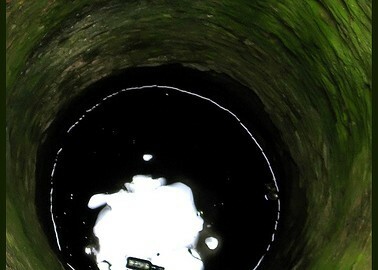 Too much solution and the water well can be over saturated causing the well owner longer wait times for safe water. That is why homeowners should contact a Raleigh, NC well pump repair team like A&T Well and Pump to sanitize their contaminated water well. Additionally, the steps required to cleanse a contaminated well are quite extensive. From conducting a video well inspection to operating the electrical system and debris removal to flushing the well and plumbing, properly measuring the chlorine solutions and testing for cleanliness, A&T Well and Pump is prepared and has the experience to complete the job. Our Raleigh well contamination specialists know how to completely disinfect your system and properly test for contaminants. After a few weeks, it will be necessary to retest the water well to ensure all pollutants have been removed. A&T Well and Pump offers 24/7 emergency well repair and disinfection services. Call us today at 919-291-4063 or complete the form below for a professional well disinfection!